Developed exclusively for BoConcept's Lugano furniture series - true, high performance HiFi sound integrated nicely with BoConcepts contemporary, Scandinavian design style. 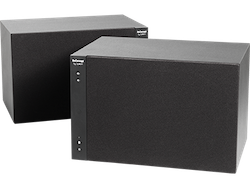 Through advanced use of Opalums own, digital platform, the system can be used both integrated with the Lugano system or as a free-standing two-piece HiFi-system. The user can switch between two sound-profiles: 'Inside Lugano' or 'Freestanding' - to ensure an astonishing performance even when hidden inside BoConcepts beautiful design.